Our new and improved laundry detergent, Persil Bio Gems is a stain remover that protects and revives the colour of your clothes. With CareClean? technology, this ultra-concentrated washing formula is tough on stubborn stains. Easy-to-use, Gems help protect and revive your clothes, by acting as in-wash bobble remover*. Perfect for an all-round, deep clean for your everyday wash, Persil Bio Gems dissolves to leave your clothes clean, fresh and revived. 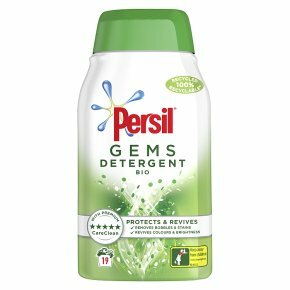 Persil Gems is our most renewable format, with an ultra-concentrated formula, packed in a 100% recycled plastic (PCR) and recyclable bottle. Available in Bio, Non Bio and Colour variants. Discover a new generation of laundry detergents, Persil Gems with CareClean? technology. Unlike other formats, Gems not only removes tough stains, it removes bobbles, reviving the texture and colours of your clothes wash after wash*. With innovative CareClean? technology, Gems offers a superior clean and care: they?re are tough on hard-to-remove stains, but caring to your clothes to help protect and revive fabrics. They work as a bobble remover and colour restorer for clothes, offering a new and exciting washing experience to help revive clothes wash after wash. Gems is unlike anything you?ve ever seen before, when you pick up the pack expecting a liquid, it rattles! Inside you?ll find a gem-like looking format, a multitude of soft white and coloured gems. Compact, yet light and delicate at the same time, this laundry detergent combines the power of an ultra-concentrated formula for the ultimate clean and care. Simply pour the Gems into the outer cap, following dosing instructions, and place upright on top of laundry, at the back of the drum and away from the door. If you?re looking for an in-wash clothes bobble remover, Persil Bio Gems has fabric-caring technology to keep your clothes looking great. Plus, they dissolve in your washing, leaving spotlessly clean clothes that smells extraordinarily fresh. Persil Gems is our most renewable format, with an ultra-concentrated formula, packed in a 100% recycled plastic (PCR) and recyclable bottle, to help protect the planet. *Bobble removal and revived colours with continued use.